Irrigation Tech has begun using weather based controllers to improve the health of our customer’s landscapes and to reduce wasted water. Most automatically irrigated yards are overwatered. If your system was installed by Irrigation Tech, it has a rain sensor. This sensor collects rainfall and shuts the system down until it dries out. Once dry, the system begins running again but what if the yard doesn’t need it yet, it will run anyway. During the hottest time of the year, your system may need to put down 50% or as much as 100% more water and the controller doesn’t know that. You don’t realize it either until the lawn starts going dormant and then it’s too late. What if there were a controller that knew what the normal water requirement was for your specific zip code and it also could measure both the rainfall and daily temperature to adjust your systems runtimes up or down? It is here, Weathermatic Smartline controller and weather station. Here is how it works. Tell the controller where in the country you are by zip code and 50 years of historical data for your specific site is loaded. 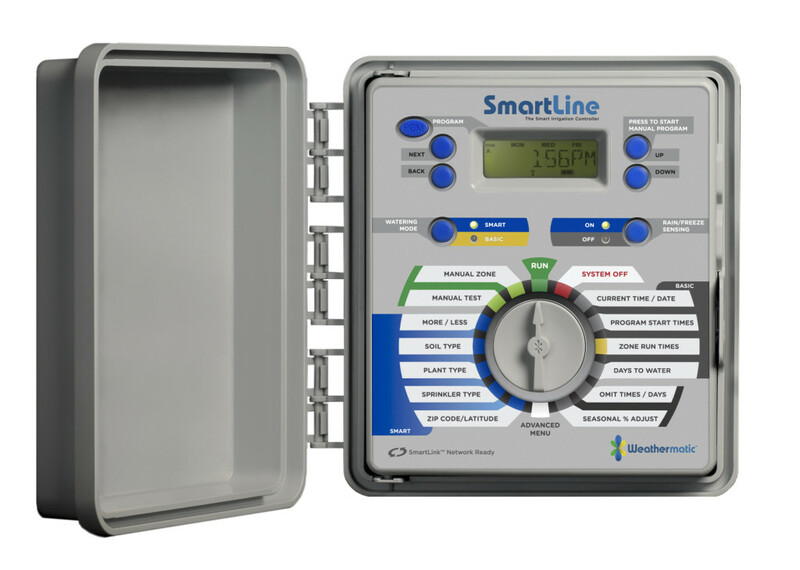 With this, the controller knows day to day how your site’s water requirement changes over the course of the average growing season. Now add the weather station, which measures rainfall and temperature, and the controller combines the historical data with actual rainfall and temperature information. This allows the controller to decide how much water to put down. It doesn’t just decide to water or not, it decides how much. Your site may have been without rain for a week but if conditions are not drying the soils, the system may still not water. During very hot conditions in late July, the system may decide to water even though it just rained yesterday. Additionally, the controller can be told that different zones have different plant types (turf, shrubs or annuals), soil types (sand, loam or clay), different sun exposures (sun, shade or part shade), different slopes (slight through extreme) and different sprinkler types. With all of this information, the controller decides how long or even if a zone will run. We can even add a flow meter to monitor water usage. The controller will learn what the flows for each zone should be and alert you if there is a deviation. This will allow the controller to catch lateral line or main line problems. If we add a wireless aircard, the controller can call you and/or Irrigation Tech when there is an alert condition. How’s that for a SMART controller?